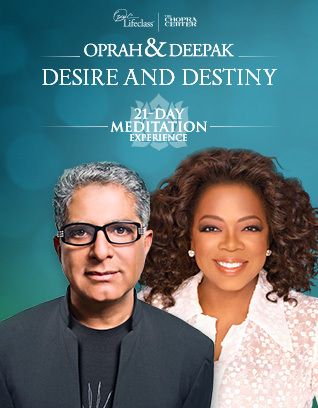 Oprah and Deepak introduced another 21-Day Meditation Challenge and the focus is Desire and Destiny. I love these meditation challenges and challenges in general! One, because they force encourage me to take a few moments each day to breathe, be still and to reflect and two, because I always learn something new about life and about myself while meditating with Deepak Chopra. The main message this go round is that your desire is your destiny. While I adore Deepak, so much so that I practically accosted him at a restaurant once, my initial thought on the matter is one of skepticism. My skepticism is perhaps because of being taught early on that ‘just because you want something doesn’t mean you’re going to get.’ And to go a step further, I also had drilled into my head was told that ‘wanting a thing doesn’t mean it’s a good thing to have.’ It is useful to note that I am a bona-fide, recovering PK (Preacher’s Kid) and in the PK’s household, desire can easily get conflated with lust and you know lust is one of the Seven Deadlies and you shouldn’t be focused on what you want as much as what you should want and oh my god, where’s the escape hatch?!?! Needless to say, all this talk about desire and destiny made me a little uncomfortable. And then, *trumpet flare* Deepak to the Rescue!! As is my deed, so is my destiny. There. Simple, clean, easy to understand and it checks out! Just as long as one doesn’t impose some sort of judgment or morality code on the desire in the first place, we’re all good. Who knew it could all be untangled so easily! One night, a family decided to go out for dinner and everyone piled into the car to find a good place to eat. The parents, two small kids and an uncle. No one had a strong feeling about where/what they wanted to eat except for the little boy who was determined that he wanted something specific but wasn’t quite sure what it was. So the adults indulged him and set out to find a restaurant that would satisfy his palate. After about an hour of driving from one restaurant to another, checking menus and dismissing options, the now deliriously hungry uncle seized the kid by the shoulders and growled ‘Hurry up and pick a place so we can all eat something!’ The destiny of all was determined by the one with the greatest desire. Got it. Here’s the Patranila Lesson. As I mentioned earlier, I’m no stranger to challenges and it’s also no secret that I don’t necessarily (OK, ever) follow them to the letter. But that’s never the point so I’m OK with that. I do, however, like to do things in order. Especially a meditation challenge because oftentimes, one idea builds on a previous idea and so on. If you miss a day or two, you won’t get the full benefit of the exercise. True to form, I fell behind in the early stages and had planned to do two-a-days until I caught up. That way, I could still hear each message, do the meditations and wring every bit of enlightenment and blah blah blah. Of course, that didn’t happen because I can barely make the time to do one meditation a day let alone two and I remained several days behind throughout the course. Let me be clear. 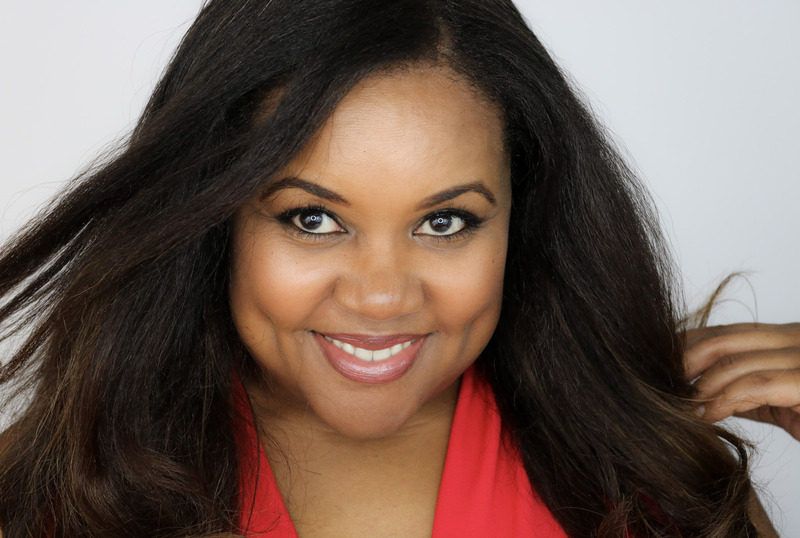 I am a firm believer in the notion that how you do anything is how you do everything and… hoozah ding, ding, ding, light bulb, watershed moment! How many times have I killed myself trying to GO BACK to do something that I didn’t get a chance to/choose to/make time to do? What Earth-shattering goodness and goodies have I missed out on in the present by focusing on what has already passed me by? You can’t. go. back. Jefferson! NOW is all there is. Worrying about what you may have missed can have you missing more stuff still!! Get your life girl! 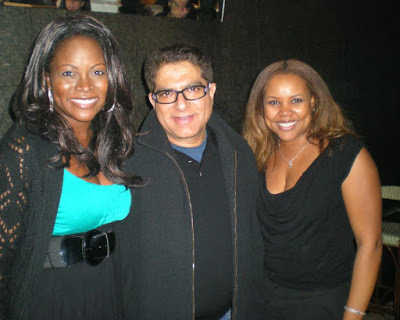 Me and Abiola during our gleeful meeting with a very gracious Deepak Chopra. And so dear Deepak, I thank you once again for your wisdom, insight and endless gifts! Never again will I try to go back to bring yesterday’s magic into today’s freshly minted potential. Can’t wait to see what lessons the next challenge will bring! Thanks for reading and if you’re interested in meditating with Deepak, the Desire and Destiny Meditations are available for download here. And here’s where you can get more Deepak on Amazon . Next Post Gorgeous Holiday Gift Sets for Beauty Lovers! I like your story about desire. Keep picking up the pieces and trying again. This meditation is a good way to capture some positive mindset and you should just take it on a per day basis. That is an awesome way to get peace and stay positive. I may have to try that challenge.. I have never meditated before but i hear it would do wonders. I'm going to look into that challenge and learn more. Thank you for sharing it. Sounds like a great challenge. Meditating is always good, especially if you use the time for prayer. I love that mantra also. I need more time for self reflection and meditation. Wow! This is like a one-of-a-kind experience! I'm sure you learned a lot. Sounds relaxing, I mediate with my Bible every morning. What a total epiphany and you make a darn good point. I'm going to remember that! I like your thoughts about desire and how many of us are taught that it is a bad thing. It can be, but it can also be our motivation to get things accomplished. Treasure every moment because you can never get it back Ty for sharing.